Is There a Hand Signal for a Bark Command? Make up your own hand command to teach your pooch to speak. Teaching your pooch a “speak” command works well for playful tricks, and may actually offer aid in getting him to stop barking on command. Hand signals work well because dogs are visual learners, but there is no set-in-stone hand gesture to get your dog to bark. You typically don't really have to actually teach your dog to bark, as he'll find plenty of opportunities throughout the day. The trick is to initiate a barking episode, and then couple it with the verbal and hand commands to connect the two actions. For example, if your pooch goes nuts when the doorbell rings, have a friend stand outside and ring the bell while you work on your commands. As soon as your pup starts barking, give both the verbal and visual commands. Stop the barking by suddenly distracting him by sticking a treat or toy under his nose. Once he stops, praise him and offer a treat as a reward. The key to effective dog training is repetition and encouragement. Keep ringing the bell and issuing the command to coincide with his barking. Issue the commands without the bell to see if he starts connecting the command with the action. Switch between using both hand and verbal commands, to only verbal and only hand. Keep rewarding him for good behavior. Don't punish or yell at him if he doesn't comply, as that will not help and may make him think you're “barking” along with him. Reduce the treats when it starts clicking and try the command in different locations to ensure it has taken root. Another command that goes hand in hand -- no pun intended -- with the “speak” command is one that tells your pup it's time to be quiet. 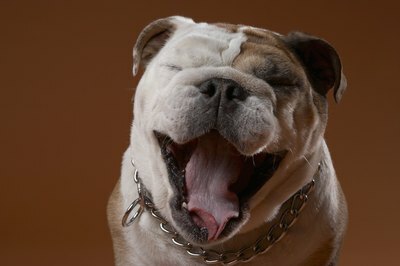 Teaching your dog to stop barking involves much the same techniques as teaching him to speak, namely repetition, distraction and reward. As with “speak,” there is no universal hand gesture for “quiet,” so you'll have to make it up. It could work with your “speak” gesture, such as closing the duck bill gesture or making a fist to indicate that the time to bark is done. How Should a Premature Kitten Being Hand Raised Behave? Do Kittens Think of Their Owner as a Mother? Should You Wake Up a Puppy to Go Pee?